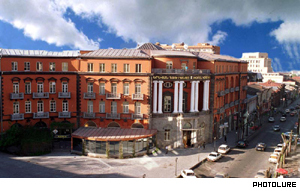 Hotel Yerevan offers upscale accommodation. Visitors in Yerevan can rest assured that they can look forward to a wide variety of Western-style accommodations during their travels. Unlike other Armenian cities, Yerevan has taken steps forward during the past few years by increasing the number (and quality) of hotel complexes, thanks to investment projects in Armenian tourism. Today approximately 30 hotel complexes are competing in the capital. The majority were built during the last few years. There are hotels which had been enjoying great popularity during Soviet times, and these days after major overhauls, compete with the newer ones. 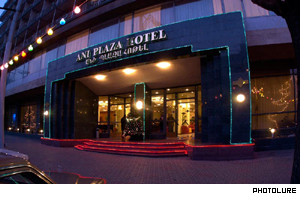 Ani Plaz Hotel is among the recently renovated. The usual requirements of Western travelers -- air conditioners, satellite TV, mini bars, alarm clocks and radios - are standard equipment in Yerevan's better hotels. Some have 24-hour room service, and the newer or newly renovated offer health clubs. Rental cars are commonly available through the customer service desks of the major hotels. Address: 19 Sayat Nova Ave. Address: 7 Griogor Lusavorich St. Address: 275 Norki Ayginer St. Address: 250 A. Armenakyan St. Address: 20 Tigran Mets Ave. Address: 39/1 Silikyan DC, 5th St.